These flies are often the answer when fish reject standard size patterns. Use soft rods and AFTM 4/5 outfits, avoid distance casts, tighten rather than strike and use a leader that takes into account the fish size expected. Do not assume that big fish do not take small flies. Try this fly on cruising fish when small upwinged flies are on the water. Fish this fly static in the surface film, ideal to hang on the washing line with a mini muddler on the point. Little more than a touch of herl and silk, on its day deadly. Tied in light olive, black and red. 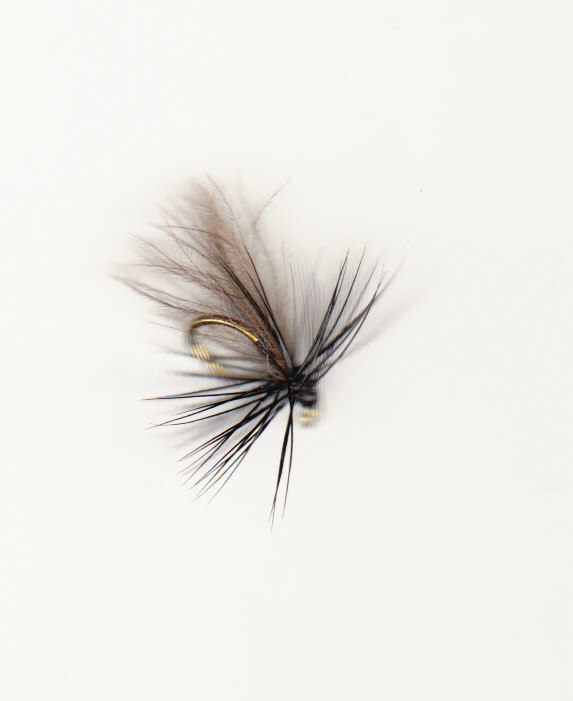 The long fibred black hackle used on this fly pricks the surface film, a sure fire trigger point on all fish. Try this when all else fails.